Interlocking pavers can add aesthetic appeal to driveways, patios and walkways. Pavers are also known to be stronger than poured concrete and are easy to maintain and repair. Before laying interlocking pavers, it’s important to create a well-compacted, stable base. Begin by excavating all unstable or unconsolidated subgrade material. To estimate the depth of excavation needed, consider the final grade of the project by adding the height of the paver unit, the depth of the bedding sand and the thickness of the compacted base material. Next, compact the paver base. You will want 3-4 inches of compacted base for pedestrian traffic, 4-5 inches of compacted base for vehicular traffic and 6-8 inches of compacted base if large vehicles will be driving over the paver installation. Fill the excavated site with the appropriate amount of paver base material and compact it using a vibrating plate compactor. The base must be well-compacted and level to provide a smooth, even surface on which to lay the bedding sand. When preparing the grade of the base, be sure to provide a 1/8-1/4 inch of drop per foot for proper drainage. 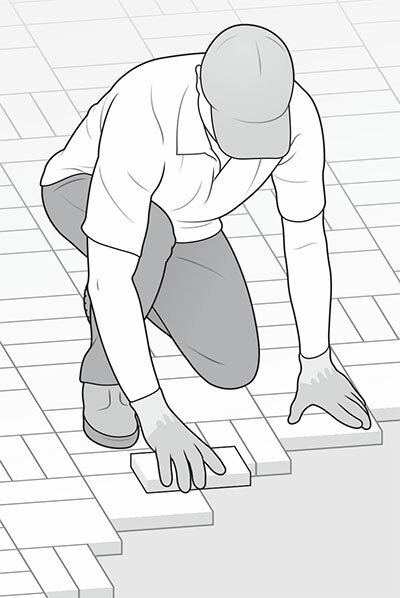 Follow these steps to properly lay interlocking pavers. A bed of sand is necessary to provide final leveling properties and help secure the pavers in place. 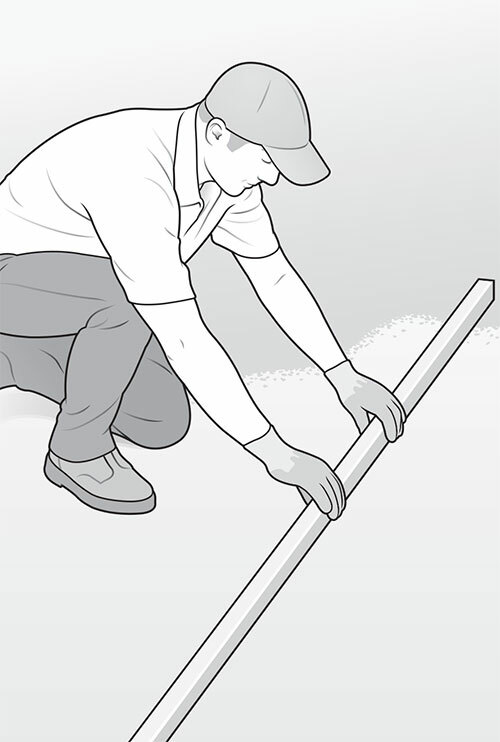 Use clean, sharp concrete sand 1-inch deep. Allow for 1 cubic yard of sand per 300 square feet of project area. 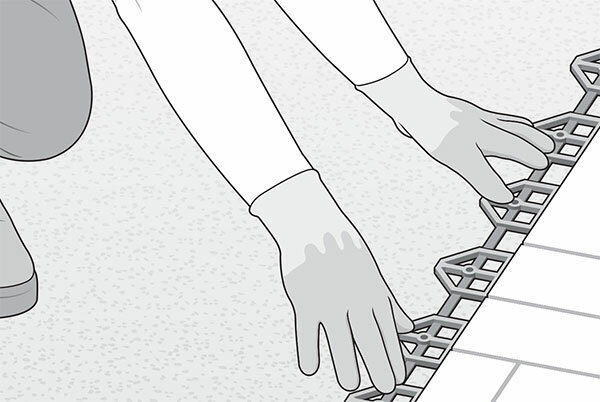 Install a stable edge restraint to eliminate any lateral movement of the pavers and sand bedding. Examples of edge restraints include an existing hard edge (such as the side of a house), vinyl molded restraints or concrete restraints. Place pavers flat on the sand bed, working in a forward motion. Start the process at either a 90-degree corner or within the field by using a pre-set string to guide the straightness of the pavers. Once the paver field and borders have been placed, spread a light layer of sand over the pavers and run a vibrating plate compactor over them to begin the interlocking process. Spread dry paver joint or masonry sand over the surface of the paver area approximately ¼ inch deep. 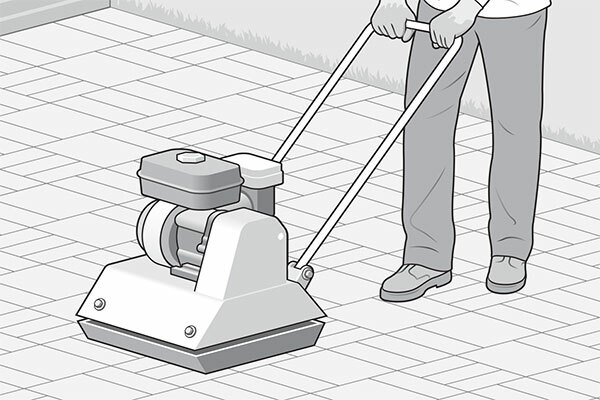 Using the vibrating plate compactor, pass over the sanded pavers two or three times to allow sand to fill the voids between the pavers. 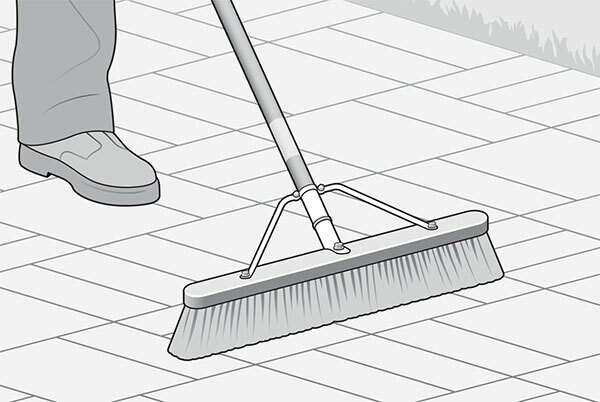 Sweep remaining sand into voids until they are completely filled. To download a PDF version of this page from the magazine to use as a training tool, click here.